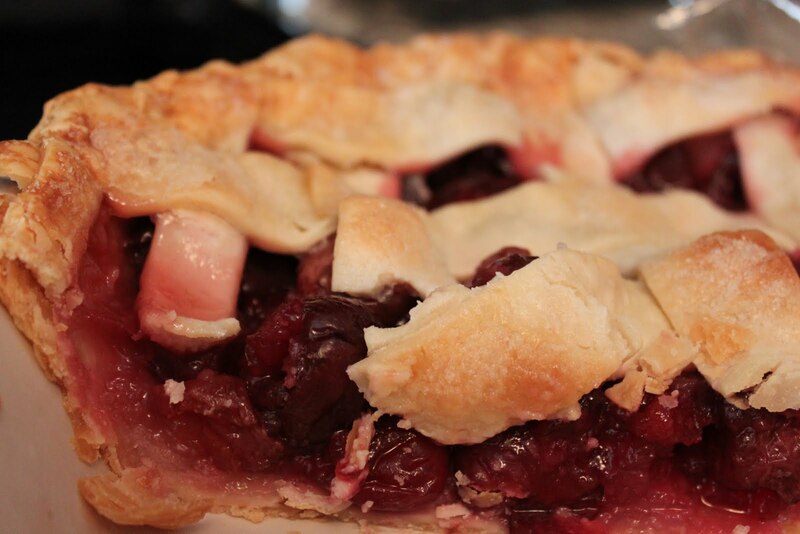 My favorite pie is cherry and a couple of weeks ago, I had such a strong craving for it that I just had to make one. Place tapioca in a spice or coffee grinder; process until finely ground. Combine tapioca, cherries, and next 5 ingredients (through salt) in a large bowl; toss well. Let cherry mixture stand 30 minutes; stir to combine. Roll 1 (9-inch) dough portion into an 11-inch circle. Fit dough into a 9-inch pie plate coated with cooking spray, allowing dough to extend over edge of plate. Spoon cherry mixture and any remaining liquid into dough. Roll remaining (9-inch) dough portion into a 12-inch circle. Cut dough into 12 (1-inch wide) strips (I used a pizza cutter for this); arrange in a lattice pattern over cherry mixture. Fold edges under; crimp. Combine 2 tablespoons water and egg white in a small bowl. Brush the egg white mixture over dough on top of pie and sprinkle dough evenly with 2 tablespoons turbinado sugar. Bake at 400 degrees for 20 minutes. Shield edges of pie crust with foil, and bake an additional 40 minutes or until crust is golden brown and filling is thick and bubbly. Cook pie in pan for 45 minutes on a wire rack. Sand, Waves and Fun - Here We Come!